Dr. Who Doll | Oh Sarah O ! 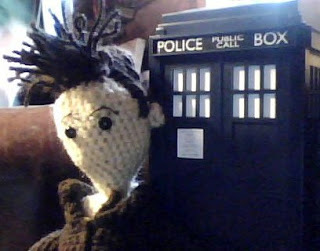 My boyfriend's mother LOVES the BBC show Dr. Who and is particularly fond of the 10th Doctor played by David Tennant. Earlier this year, the Boy and I picked up a 10th Doctor Screwdriver from a British imports store for his mom and I knew that he was getting her a Dr. Who Telephone Booth Cookie Jar for Christmas. 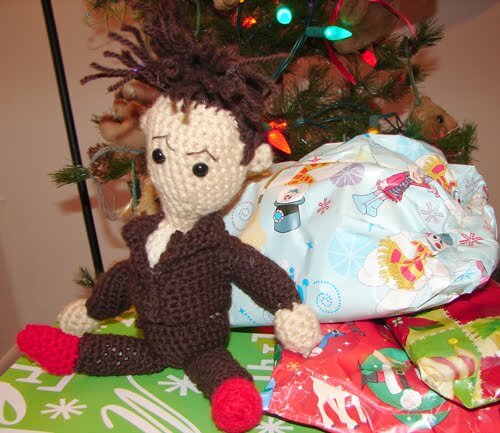 So, continuing on with the Dr. Who theme, I naturally decided to crochet a David Tennant/ Dr. Who doll to give to The Boy's mom for Christmas. 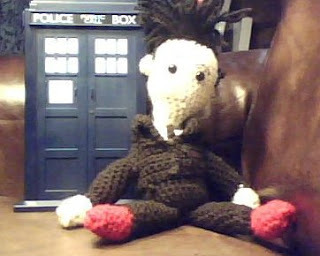 I used bits of yarn that I already had on hand and Tracy J's Dr. Who Doll pattern (seen here on ravelry and here). I even added his red trainers. He turned out so well, that I had a hard time parting with him. 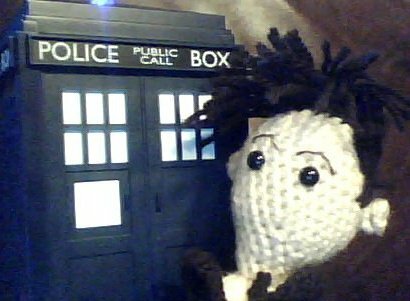 But, alas, I could not separate the Doctor from his Telephone Booth and Screwdriver (otherwise he might get overtaken by Daleks). The Doctor was very well received on Christmas day (I believe there were squeals involved) and his mom snapped some additional photos of the Doctor posing with his Telephone Booth on Christmas Day.